One of the categories for Book Riot's 2018 Read Harder Challenge is "a one-sitting book". That's really hard for me. I tend to be a distracted reader. I need to take breaks. I need to put it down for awhile and do something else. I very rarely finish a book all in one go unless I'm doing a weekend reading challenge. Even when I was serving on the Newbery Committee, I was much more likely to read half of a book and put it down and start another and then finish up the first book the next day. So, when I tell you that this book was nearly a one-sitting read for me, I want you to know what that means. My husband and I are currently working our way through Star Trek: The Next Generation on Netflix (which I have never seen and am hugely enjoying) and I even turned down watching episodes to read this book. 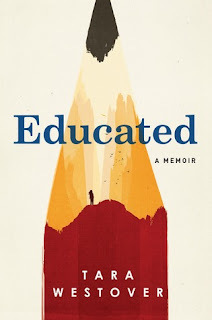 Educated by Tara Westover is a memoir from a woman with an unusual upbringing. Brought up by off-the-grid end-of-days-preppers on a remote mountain in Idaho, Tara was never vaccinated, never saw a doctor or dentist, and didn't even have a birth certificate until she was 9 years old. And she never went to school. Her mother attempted homeschool from time to time, but there was always too much work to be done at her father's scrap metal business for a real education to take place. When abuse from family members escalated, Tara knew that she needed a way out. Some of her older siblings had found ways out: marriage, jobs... and her older brother Tyler had gone to college. Tara began to dream of going to college, too. But that dream seemed impossible. She had never taken an exam in her life, but now would have to ace the ACT to be considered by colleges. She had never studied or written an essay. She had never heard of the Holocaust or the Civil Rights Movement. It's not really a spoiler to tell you that she makes it out. In fact, Tara Westover went on to not only complete her Bachelor's degree but to study overseas and eventually earn a PhD. It only makes her unusual upbringing that much more fascinating to know how she ultimately went on to live a very different life. I mean, what Tara and her family members endured... I couldn't look away from this book, even as it completely disturbed me. I completely take for granted that if a horrifying accident happened to me or someone around me, we'd go to the hospital. That wasn't an option for the Westovers. And they just kept surviving medical trauma that I thought for sure would kill them. Like, I knew Tara would eventually be at least relatively okay because I knew she had gone on to write this book. But I had to read it to believe it and to see how she would possibly escape. Hand this book to folks who enjoyed memoirs about others with unusual or traumatic childhoods like The Glass Castle by Jeanette Walls or A Child Called It by Dave Pelzer. Although this book is published for adults, I think there's a great deal of crossover appeal for teens, particularly teens who enjoyed either of these readalike memoirs. Educated: A Memoir by Tara Westover. Random House, February 2018. 352 pages. Reviewed from ARC provided by publisher.